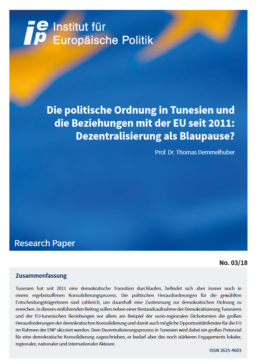 Die politische Ordnung in Tunesien und die Beziehungen mit der EU seit 2011: Dezentralisierung als Blaupause? Since 2011 Tunisia underwent a democratic transition, yet still finds itself in the middle of a consolidation process. Political challenges are still too numerous to allow for permanent acceptance of the democratic order. This introductory article should, next to supplying the reader with an inventory of the democratization of Tunisia and the EU-Tunisia relationship, outline, by means of the example of the socio-reginal dichotomies, possible opportunity windows for the EU in the course of the ENP. Huge potential for democratic consolidation is attributed to the decentralization process in Tunisia although more engagement of local, regional, national and international actors would be needed. The whole article by Prof. Dr. Thomas Demmelhuber can be downloaded here.